Our next entry into the GTW archives comes thanks to Francesco Milioni, which was due for release on a tape compilation to be released in Italy, but was too late due to the declining C64 market. 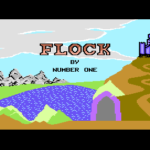 Flock is a clone of Satan’s Hollow, and borrows graphics from the original game and various sprites, music and routines from other titles. The result is an original game though where you must shoot down flocks of birds. Francesco built the game in assembly, possibly with some in compiled BASIC. It’s a simple but fun shooter which was typical of the games found on the Italian compilation tapes that were so popular. Many of the games would be hacked versions of released titles, with different titles and sometimes graphics.